Starting today, I will be sharing one of my favorite beauty products with you every Thursday. In these posts, I will review a favorite product of mine, varying from make up to skin and hair care! I get asked about my eye liner quite often...I have even been stopped by a complete stranger! The answer is Laura Gellar Liquid Eyeliner. 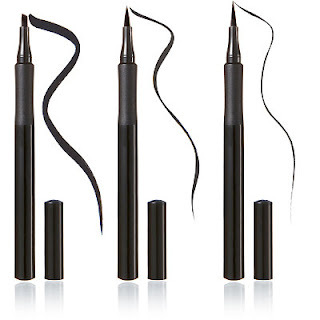 I was in the market for a liquid eyeliner pen earlier this year and discovered this set at Ulta. Let's just say, I'm obsessed. There are 3 liners in a pack- Classic, Fine and Slanted- each with a different "marker" tip. I use these eyeliners on my upper lash line on a daily basis! They glide on smoothly, are easy to use and are long-lasting! I apply my liner in the morning and it stays put throughout the day into the evening! The classic tip creates the perfect natural line and I get the most wear out of this pen. For a thinner line (great for daytime use), try the fine tip. Make sure to apply the liner as close to the lash line as possible! The slanted tip is great for bold and daring cat eye looks. I encourage you to give these liners a try, even if they are out of your comfort zone! The "pen" style really makes it easy. Get yours here, here, or at your local Ulta. Visit my blog next Thursday to read about another favorite, every day beauty product! I haven't tried it yet but definitely going to check it out now!